The August 2015 issue of Safari– a knowledge and science magazine from India – is out quite on time, and here are our views and reviews on the same. First of all we would like to mention that Safari magazine completes 35 years. And they deserve our hearty congratulations and more importantly appreciation for the same. It is very tough to run a magazine for so many years, and it is very very tough to run it if it belongs to knowledge and science genre. Though the journey was not smooth for the magazine as well. During this long period the magazine was stopped publishing for 5 times! Important thing is, it re-started every time. The cover page is having hard colors and it leaves an impact on the reader. It shows an illustration of Robert Clive, the man, who can be considered as the pioneer of India’s long custody under British rule. In addition small pictures about various other articles from the issue are also portrayed on the same. It is well known fact that the main aim of East India Company, was to run business operations between Briton-India. The company thus sought for permissions from various rulers (including kings, nawabs, sultans) from Indian state. Though, later they found internal differences and rivalry between various status and used it to keep them fighting against each other. Slowly but steadily the company entered into taking political control over various segments and ultimately the entire country. Neither the results nor the reasons meant to be political only. The agenda was to earn as much money they can and transfer it to Briton (from India). 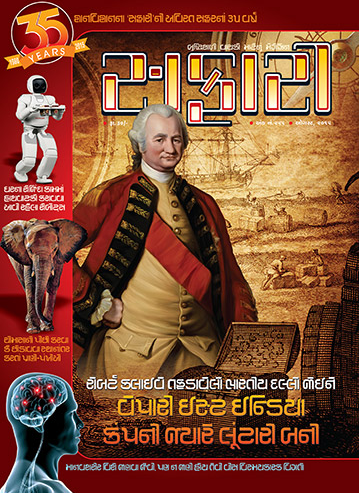 Robert Clive, was working at lower level in East India company. He was ambitious and clever. How he found opportunities to capture various segments of India and how it would be followed by his successors, is explored pretty authentically in the article. The article talks about wrongdoings of the British, and at the same time, points finger towards the attributes of Indians, which were responsible for this long dark era. A genuinely written article which explores a lot of historical fact in pretty nice manner. Usually, such facts are not represented to the people properly in regular books. Some genuine historians, economist and other figures (including British) have explored it nicely. The article is good source of such information. As the Independence day of India is approaching (15th August), the article is quite on time. It definitely help people to learn from the mistakes of others. An article not to miss. Survival is the ultimate instinct and all the living creatures are gifted with at least one specific “sense” or “ability” to let him/her/it achieve it. Harshal Pushkarna’s article about “Animal’s instincts” (about monsoon) is not only for the nature lovers. It is studded with various unbelievable examples to elaborate the topic. Some cool photographs make the article more attractive. Sushil Bhatia’s article about Atacama Desert (the driest non-polar place on the Earth) is informative too. The discussion about people’e efforts to earn water from the humid air and use it, is eye-opener. It tells us that why each drop of water is very important to save, and what it means for many. B. M. Purohit’s article about facts of human body explores 20 facts which are mostly unknown. It is more of statical than the biological, interesting though. Reading D. N. Kaushik’s article about Mount Tambora is like reading a thriller. The statistical information about the havoc, the explosion of this Volcano have created, will pass a chill form the bones. Indonesia is affected the most with such volcanic disaster and Tambora explosion is one of the deadliest. Which is the best drone of the world? Why Alaska, despite of not being within the geographical periphery of America, is an American state? Does Fort Knox (where the gold reserve of America is stored) is attacked for robbery? Does America have had any woman president till date? What is the amount of black money is there in the swiss bank which belongs to India? Why are some scientists oppose RO based water-purifiers these days? What makes the dog capable to hear the voices we cannot? What is the amount of digestive juices our body release/use daily? What is aurora (the multi-colored light, seen in the polar areas mainly)? It is said that the birds always reach their target point during seasonal trips, is it true? Why NA and CL both are individually harmful, but their combination NACL (salt) is not? Why the “Malhar” is associated with monsoon? Does downloading of data affect on the mobile phone’s weight? Why a house thoroughly cleaned contains dust and other such particles again the next day, despite of having closed windows and doors? A very detailed article about Robots, the advancements of the Robotic technology and the future of Robotics is nicely written. The article tries exploring an answer to the question that, Is it possible that as portrayed in various Sci-Fi films, Robots can take-over us? and Will we have the Robot servants as a matter of fact? The magazine is very informative. Most of the articles are written in interesting manner. The facts are represented with fearless, unbiased, to-the-point, factual representation. A – not to miss – issue.